This is the openingstrack of a CD that I bought the day before yesterday. 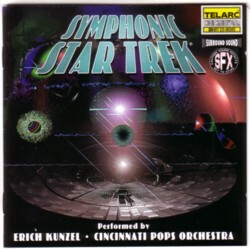 It is ”Symphonic Star Trek” by Erich Kunzel and the Cincinnati Pops Orchestra, and they play music of the motion pictures and television series of Star Trek. I liked to watch Star Trek when I still watched television, but I never stayed home to watch it. My favourite Star Trek record is an LP with sound effects, but somehow I have accumulated more Star Trek music over the years than many people will know to exist. There is always more of anything, of course, and considering the popularity of Star Trek you can imagine that there must be hours and hours of Star Trek vinyl, tapes and CD’s. More about that later! Maybe this should explain why the CD is so good?